The CCU186 control unit for crawlers possesses a distinct advantage compared to existing products. In fact, all of the performances that are usually achieved with standard control units are now available in the crawler configura­tion. Automatic slow preheating, the progressive rise in voltage with each exposure, as well as a selection of set values are all included in the CCU186. As the CCU186 has been entirely fitted with industrial electronic components, it is perfectly suited to the often extreme conditions of automatic intra-tube control campaigns. All of the generators in the SITEX crawler range are automatically identified and controlled by the CCU186: the interchangeability is total and this can be instantly implemented on-site. Moreover, thanks to a conversion kit, these generators will operate in perfect sync with the SCU286 standard control unit. 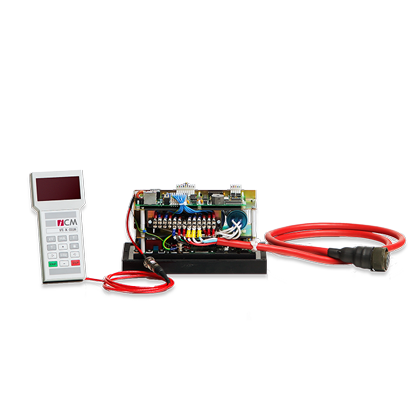 Fitting a complete control unit (that includes a display and keypad) to a crawler needlessly exposes components that are more fragile by nature to the extreme intra-tube conditions. The ICM solution to this problem is an independent pocketsize remote control unit: the CCU186R. The CCU186’s unique 120VDC power supply creates a direct and straightforward communication with the electronics of the crawler itself. While the CCU186R controls the preheating and the kV and mA programming procedure, the crawler controls the execution of the exposure and its duration. In return, for each of the exposures, it receives confirmation that they have been executed both efficiently and in line with the programmed kV and mA radiological parameters. It is essential to simultaneously discharge the various constituents of the battery. For this purpose the CCU186 requires just one supply voltage (from 105 to 140 VDC). Regardless of the voltage delivered, the kV and mA are maintained in a strictly constant manner to within ± 0.5% by an accurate control system. To save energy, the CCU186 has an automatic standby system that ensures the general consumption is reduced to a minimum. For example, the CCU186 disconnects the cooling fans if a command has not been issued for several minutes. If an accidental interruption occurs, the power supply immediately causes the settings to be saved, which enables the unit to be restarted without any problems.